Summertime and the livin’s easy! Ok, not every day is easy. I wish I could sit by the pool and sip lemonade all summer long, but there is that little thing called work. And oh yeah, I have a 9 month old who won’t sit still. So I may not be relaxing by the pool this summer, but I am finding time to enjoy the little joys of summer. One of those joys for me is simple summer cooking. 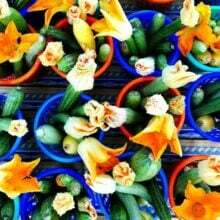 Fresh summer produce is at it’s peak and I can’t get enough. I love creating meals with the produce we find at our local farmers market. 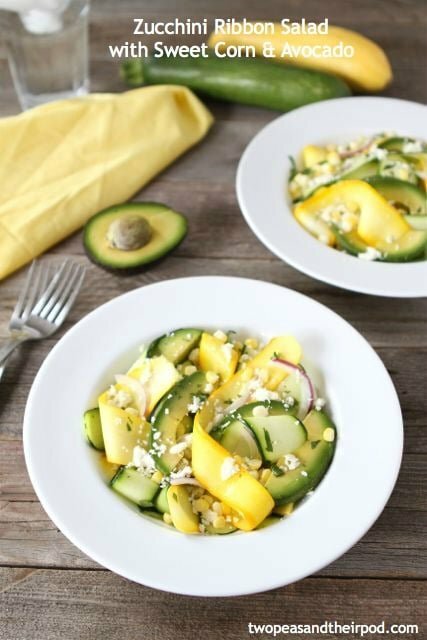 My new favorite salad is this Zucchini Ribbon Salad with Sweet Corn and Avocado. I am always coming up with new ways to use zucchini. I’ve made zucchini brownies, fries, cupcakes, salads, bread, and of course cookies. 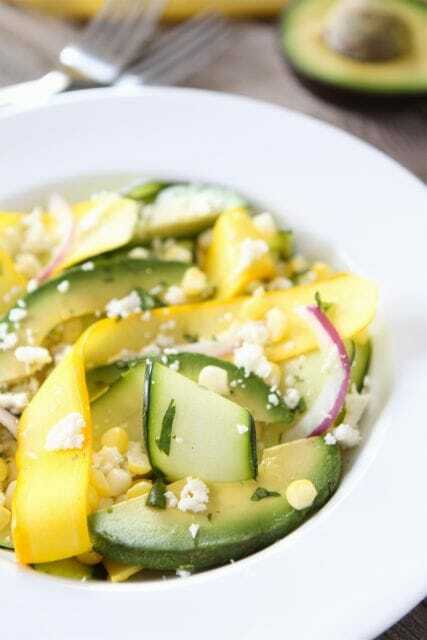 This Zucchini Ribbon Salad with Sweet Corn and Avocado is my latest zucchini creation and it is a winner! I hope we never run out of zucchini because I want to make and eat this salad all summer long. This salad may look fancy, but I promise it is easy to make. You don’t need a fancy kitchen gadget to create the slender zucchini ribbons. All you need is a vegetable peeler. I know you all have one! Cutting the zucchini and yellow squash into thin lengthwise ribbons creates an elegant presentation. This salad is so pretty to serve. Your family and friends will be impressed when you put this salad on the table for dinner. 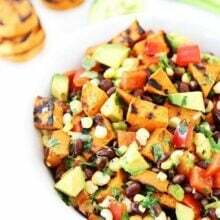 To the squash ribbons, I added sweet corn, red onion, cilantro, avocado slices, and a light lime dressing. I topped the salad off with queso fresco, a fresh Mexican cheese. I love everything about this salad-the flavors, textures, taste, and appearance. 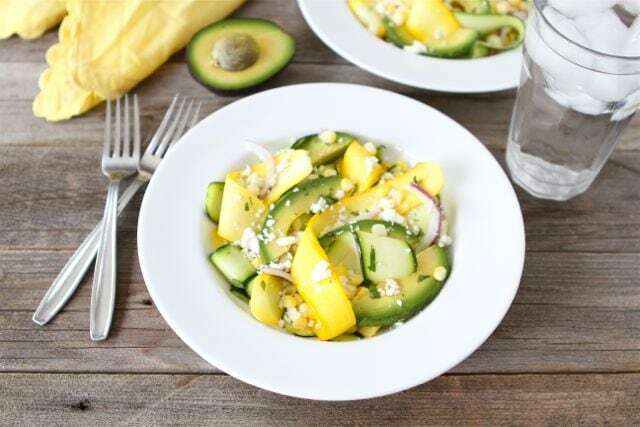 If you are looking for a new way to use your summer zucchini, you have to try this Zucchini Ribbon Salad with Sweet Corn and Avocado. It is summer perfection! Don’t worry if you can’t lounge by the pool every day. There are many things to appreciate during the summer months and this salad is one of them. This salad certainly brightens my summer days! 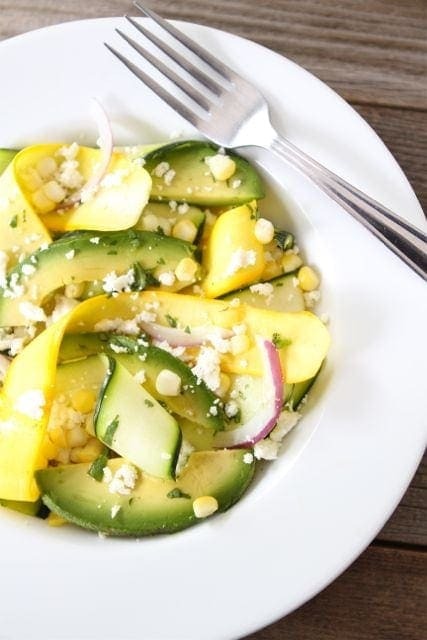 Ribbons of zucchini and yellow squash with sweet corn, avocado, cilantro, queso fresco, and a light lime dressing. This elegant salad is simple to make and a great way to use up the summer zucchini. 1. In a large bowl, whisk the olive oil and lime juice together. Season with salt and pepper, to taste. 2. Trim the ends of the zucchini and yellow squash. With a vegetable peeler, shave lengthwise into long, wide strips about 1/16 inch thick. When you get to the center of the zucchini, turn the squash over and slice from the other side until you get to the center again. 3. Put the zucchini and yellow squash ribbons in a large bowl. Cut the sweet corn kernels off of the cob, cutting close to the cob. Discard cobs. Add sweet corn, cilantro, red onion, and avocado slices to the squash ribbons. Pour olive oil and lime dressing over salad and toss until coated. 4. Crumble queso fresco over the top of the salad and season with salt and pepper, to taste. Serve and enjoy! Note-you can find queso fresco at most grocery stores. I like to buy it at our local Mexican market. If you can't find it, use feta cheese. Those ribbons are so pretty – what great flavors and perfect way to use up summer veggies. This is a beautiful bright salad and so perfect for summer – a great way to use up that zucchini that overwhelms the kitchen in summer! On my list for this week! Looks great and i love avocado! Yum! What a great and fresh dish!!! Yum! Going to make this for lunch. Can not wait to make this! Looks so summer-y! I make a salad similar to this that I love…FYI…your recipe ingredients call for LIME juice but your instructions talk about using LEMON juice and zest. Thanks for catching that. I updated the recipe. I only used lime juice. Perfect! I have a neighbor who keeps giving me zucchini and I feel like I have exhausted every option! This looks like what’s for lunch! What a great way to use zucchini! This salad sounds wonderful! Another great recipe to use up all the zucchini! Lime, cilantro……some of my favorite flavors! You are killin me with your amazing summer recipes girl! We have SO much zucchini, I cant wait to try this!! I love the simplicity and freshness of this salad. Yes, zucchini definitely does seem to take over the world at this time of year and I’m always looking for new ways to prepare it. 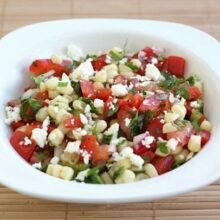 absolutely perfect summer salad Maria – that combo rocks!! What a wonderful way to use a variety of summer produce in a single dish. Looks amazing!! I love everything about this salad. I wish I had zucchini coming out of my garden to make this with. Guess I will just have to go to the farmers market this weekend and pick some up! I’ll take zucchini and summer squash anytime, too! I love the flavor combos that you used, especially the avocado with lime and corn. Perfecto! What a great way to use up that bumper crop! I have them coming out of my ears. I’d never have thought to do something like this! This looks GREAT!!!! Hope to try it soon. I have zuch and limes coming out of my ears right now. Great timing with this recipe! I wonder how this would taste with the addition of some cucumber ribbons (cucumber is another thing I have a glut of… note to self, do NOT plant four cucumber plants next summer). I love zucchini, looking forward to trying zucchini ribbons! I’ve been wanting to try to make a zucchini ribbon salad of some kind, and this may be the recipe that helps me finally get around to doing it! Hi Maria! This looks scrumptious…and very healthy too. A good way to get kids eating their veggies. That sounds sooo yummy and the colors are gorgeous! Ah, so simple and SO tasty! I love how easy and fresh this is! Great recipe. Good thing we have a load of zucchini’s coming our way via out monstrous plants out front! YUM! I can’t remember ever having zucchini and avocado together. Totally makes sense. I can definitely see the allure of this salad! It has all of my favorite summer ingredients in one! This is so pretty Maria, I love it! Definitely a great lunch idea for summer. This is so beautiful. I’m always looking for new things to make with zucchini, too. What a refreshing summer salad! what a gorgeous and refreshing salad to have this summertime! i’m in love with zucchinis, corn, and avocados. seriously, all the best ingredients in 1 dish! Zucchini and avocado are two of my favorite summer living foods 🙂 This salad looks like the perfect use of both! It looks elegant and delicious, Maria! I recently have been told I need to try a gluten free diet to see if it helps with some stomach issues so I was super excited to see this recipe on one of my favorite food blogs. I made this for dinner tonight with some grilled chicken and it was awesome. The flavors would so well together. I am sure I will be make this several more times this summer!! A bowl of this, a margarita, and you have one happy guy over here! I’m totally making this over the weekend. just beautiful. This looks s light and refreshing Maria! I love all of the ingredients, so I’m sure I’ll love the whole dish together. Sounds wonderful! I’m so happy to see this recipe! 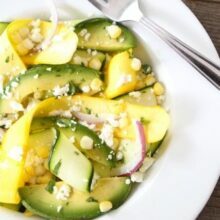 We have yellow and zucchini squash growing out of our ears (okay…our garden…) and have been wanting to collect fresh squash salad recipes like this. Pinning it to my “To Try” board! 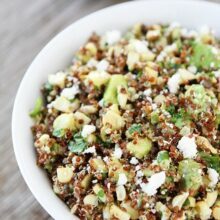 I adore every single ingredient in this salad! I can’t wait to make it! This would have been the perfect lunch or dinner for me today. I was super hot in Los Angeles today and will probably continue. I am def making this, this weekend! I could go for a zucchini salad every day this time of year! Such a beautiful dish! Incredibly lovely blog as well! We just made this last night and it was delicious. We made two changes: left out avocado (we didn’t have any in the house) and added grilled shrimp to make this a main course. We also used feta as was recommended. I made this recipe this evening. I used my mandolin to slice the squash and red onion thinly. I didn’t have fresh corn but used 8 oz of thawed and rinsed frozen sweet corn. I didn’t have cilantro but the salad was still excellent. My sister could stop raving about it. The dressing was so simple too! I put the dressing ingredients in a small canning jar and shook it up. Worked perfectly. Thank you for sharing this recipe!